Ribwort plantain (Plantago lanceolata L.) is a stemless herbaceous perennial plant, 20 to 80 cm high. It has a thick rhizome and fibrous roots. Leaves are arranged in a dense rosette. Petioles are as long as leaves (10-20 cm long). Leaves are lanceolate, 1 to 3 cm broad and glabrous or sparsely pubescent (more hairy in dry habitats). Inflorescence is a short spike, densely flowered with white flowers. Fruit is a capsule, 3-5 mm long, with 1 to 3 seeds. Seeds are yellow brown to dark brown or black, oblong, 2-3 mm long and mucilaginous when wet (Gurib-Fakim, 2006). The mass of 1000 seeds is 1-1.5 g (Ecoport, 2009). Its mucilaginous seeds are used as a thickener in the cosmetics and ice-cream industries and as a gelling agent for tissue culture (cheaper than agar-agar). 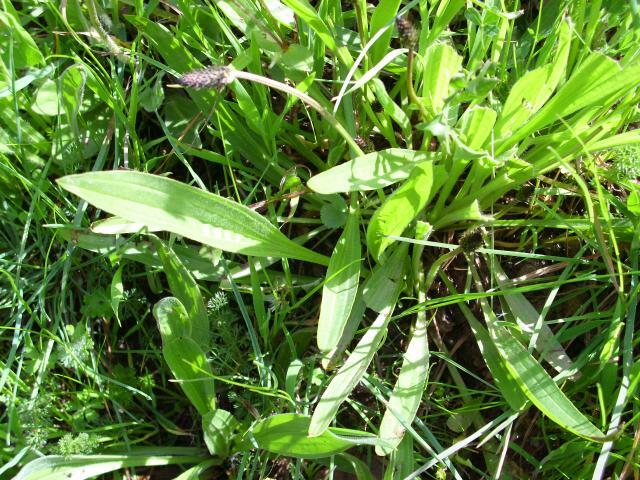 It may be grown as fodder and is considered to be of better quality than Plantago major. Forage yields of special cultivars in New Zealand may reach 20 t/ha (Gurib-Fakim, 2006). Ribwort plantain originated from Europe and Central Asia. It is now cosmopolitan and naturalized in tropical and southern Africa, Australia, New Zealand, Canada, South America, the West Indies, the Mascarene Islands and Madagascar. In the USA, it is regarded as a noxious weed in 28 states (USDA, 2009). It grows in disturbed areas, roadsides, open woodlands and grasslands. It is tolerant of drought but will not withstand saline soils. In pasture stands, it responds well to fertilizer but will not benefit as well if mixed with other plants (Gurib-Fakim, 2006). It will not withstand heavy grazing and may disappear from the sward (Mosquera et al., 1999). Ribwort plantain has a good nutritive value with high vitamin and mineral contents (Cu, Ca, Se) (Kostuch et al., 1997; Kozowski et al., 1996; Wilman et al., 1997; Moorhead et al., 2002; Bilbao et al., 2007). It is known to contain compounds such as antioxidants and anti-inflammatories (Al-Mamun et al., 2007). Ribwort plantain is palatable to cattle (Kozowski et al., 1999). It is recommended in pastures including grasses and legumes as it may improve the Cu content (Bilbao et al., 2007). However, it is less consumed than a large variety of grasses or legumes, such as prairie grass, kikuyu (Pennisetum clandestinum), alfafa (Medicago sativa) or white clover (Trifolium repens) (Horadagoda et al., 2009). 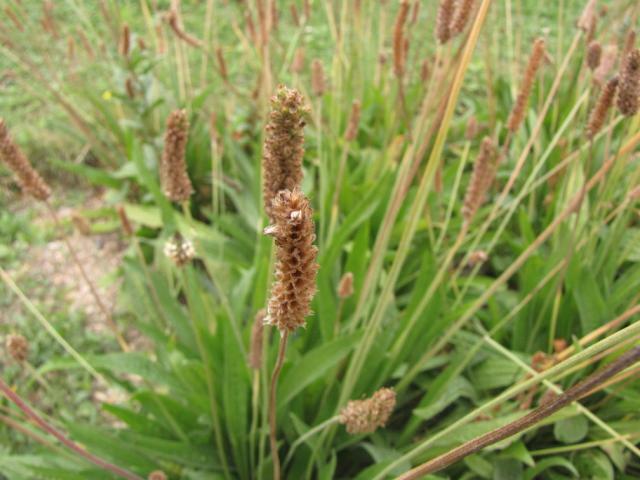 In calves, ribwort plantain reduced egg output of gastrointestinal parasites and allowed a slight increase in live weight (Sievers et al., 2006). In sheep grazing swards of white clover, ribwort plantain was fairly palatable (Clark et al., 1985). It proved to be suitable in combination with grass in swards to sustain growth in finishing lambs (Moorhead et al., 2002). It may also be recommended as an alternative to hay (Al-Mamun et al., 2007). However, compared to chicory (Cichorium intybus), it supported less live-weight gain and lower hot carcass weights (Fraser et al., 1996; Deaker et al., 1994). It had less effect than chicory in reducing lamb parasites (Knight et al., 1996). 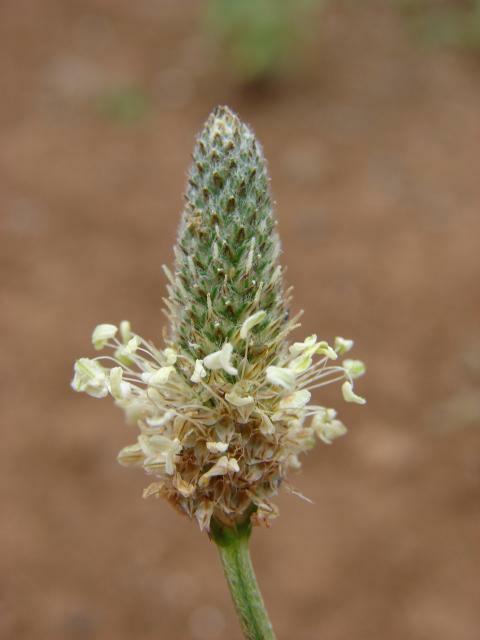 Ribwort plantain can be fed to weaned piglets as it is a source of fibre. It was included at up to 8% DM in the diet without deleterious effects on pig performance (Lindberg et al., 2006). There have been attempts to use ribwort plantain in mixtures of herbs acting as growth promoters in pigs in order to replace antibiotics or probiotics, but the results were not consistent (Grela et al., 2007; Dedkova et al., 2006; Grela et al., 2001; Grela, 2000).